Now you'll be living in a dirt room"
What I've listened most of the working time, and partly what Suigintou is thinking of doing to Shinku. My original idea was a cemetery scene, with fallen crosses, dark sky, bright moon and some fog, but the didn't turned out well, it didn't worked out at all, well I can't expect to gain full experience in a couple of months so I went with something easier in the end, Suigintou in N-field. And Yes her hair is blue, you're seeing right, I usually do the outline, or part of it since I get bored at some point and affer that I arrange it in a wall. Coloring came last so I went with blue from the start, since I wanted her to blend a bit with the wall. At the end I thought that maybe a ligher color will work, so I have a second version too, but I like this one the most. Now to each it's own. Vectored Suigintou from this Click taken from shuu. As you can see I took her wings out, I dislike them since they don't even look like wings. Doing the hair and the headband was quite fun. I Had 40 layers on Gin and 40 on the wall after I merged some parts, and no, those small lights aren't count as layers. Comments, tips, constructive critics and favs are appreciated. Enjoy. Browse Ryo (Metamor) Gallery: Recent | Popular. oh wow,the wall is just magnificent! very nice wall! love the vector and colors. thanks a lot! Hmmm..I'll try to be objective. Rozen Maiden is one of my fav animes and Suigintou is one of my fav characters (fav negative ones, at least...I also like Kanaria and of, course, the wonderfully red Shinku). Her personality is so complex and I love her colours: she is the darkest Rozen Maiden. About the wall: first I love the two major changes you've done here: the wings were a bit too much. The wall needed a bit of simplicity that allows the viewer to admire her beautiful face and the detail of her clothes. All those awesome garnments give such a 'baroque' feeling. I'm very fond of such complicated outfits especially when they are beautifully vectored. So great job with the clothes! 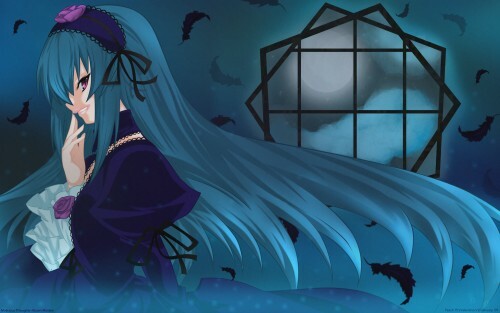 I love Suigintou's blue hair. The white hair version (which is more faithful to the original) is also nice, but I think this is quite original and that it also suits the wall. This wonderful blue hair does wonders for the desktop. It looks so nice! I always admire somebody who can take risks and here the result was worth the transformation. When I get bored with this one, I can try the second. Conclusion - you reunited some great elements that I like: Rozen Maiden (Suigintou), clean vectoring, nice details, great strong colours (blue) and originality. On the other hand, the song that inspired you is a bit...'malitios' (screaming through the duct tape, gosh!). I also think the name of your vector suits the subject. Yes, you certainly have evolved since your last vector (for another great anime : Lovely Complex). just there. But I mean if it was meant to be simple then don't worry about it. looked suitable for her. Maybe having candles around and some pillars up high. like an actual scene rather than just a gradient and a window. but thats totally the scans fault so no big deal. no need to bunch them, just give them a natural flow look. the clouds are like a aquamarine blue which looks weird compared to the moon. on the bg is all. Hope the advice helps. remove the gradients, or blending them better with a blending mode, the bg would look much better if it were blacker, to offer some contrast or at least add a focal point. looks like she has a evil laugh but, i love what u've done wid it! the tones of blue work out just fine! thanks for sharing lovely wallpaper.